The lead-up to Taiwan’s presidential elections on January 14 is dominated by sharp differences within the country’s ruling elite over relations with China. The first television debate took place in early December between the three candidates: incumbent President Ma Ying-jeou of the ruling Kuomintang (KMT); Tsai Ing-wen from the main opposition Democratic Progressive Party (DPP); and James Soong, a former KMT power broker from the People First Party. Central to the debate was Taiwan’s relationship with China, which regards the island as a renegade province that broke away after the 1949 Chinese Revolution and has threatened to forcefully reunify the island if it declared formal independence from China. The KMT, which ruled Taiwan as a military dictatorship until the late 1980s, has been seeking to improve economic ties with China. Last year Ma signed the Economic Cooperation Framework Agreement (ECFA) with Beijing, along with 14 other deals to open up trade, investment and transport links between Taiwan and the mainland. Amid worsening global economic turmoil, those agreements have not brought the promised jobs and higher living standards. Chen was convicted of misusing a secretive presidential fund that was employed to bribe small countries in South Pacific and Latin America to diplomatically recognise Taiwan rather than China. The DDP, which was illegal under the KMT dictatorship, has cautiously promoted a more independent Taiwan, without antagonising China. Chen’s jailing on dubious corruption charges was clearly aimed at sending a message to Beijing that the KMT wanted better relations. At the same time, Ma warned of a return to heightened tensions with China, as happened under Chen, seeking to appeal to widespread concerns about a war with China, as he did in the previous presidential election. Ma pledged to negotiate a peace treaty with Beijing within 10 years. Ma spelled out the KMT’s orientation toward China in recent comments to Time magazine. While Taiwan was vital to the US interests, he said, China “is our largest trade partner, our largest investment destination, and our largest source of trade surplus. These are incontrovertible facts that must be faced.” At the same time, the KMT government has been seeking to buy advanced weapons from the US, including F-16C/D fighters, in order to enhance Taipei’s bargaining power with Beijing. Tsai challenged Ma on his continued support for the “92 Consensus,” an agreement reached between Taiwan and China in 1992 that implied both sides accepted “One China”—that is, that Taiwan is part of China. It gave room for Beijing to insist it was the legitimate government of People’s Republic of China and for Taiwan to claim it was the government-in-exile of the Republic of China, but ruled out the idea of an independent Taiwan. Tsai made no reference to her proposal for “special state-to-state relations” with China—a deliberately unclear term designed to stop short of asserting Taiwanese independence. However, when the KMT government of Lee Teng-hui adopted the formula in the mid-1990s, Beijing denounced Taiwan for moving to independence. The ensuing tensions brought Taiwan to the brink of war with China, with US deploying two aircraft carrier battle groups into the Taiwan Strait. Challenged by Ma, Tsai refused say whether she would formally announce a policy of “no independence.” Ma insisted that his policy of “no unification, no independence, no use of force,” based on the “One China” principle, represented the main opinion in Taiwan. 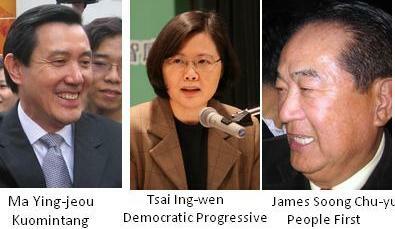 The third candidate James Soong, who has no chance of winning, is more strongly oriented to China than the KMT. He said he wanted to establish Taiwan as “a gateway, a hub into China for international multinationals.” He is likely to divert votes away from the KMT and increase the DPP’s changes of winning. The election campaign is taking place as the Obama administration adopts an increasingly confrontational approach to China, cementing closer diplomatic and strategic ties with countries throughout Asia. Last month, Obama visited Australia to announce a stronger US military presence in the north and west of that country, then attended the East Asian Summit in Bali where he encouraged South East Asian countries to press their rival maritime claims in the South China Sea against China. The DPP clearly views Obama’s aggressive stance as an opportunity to press the case for a more independent Taiwan. Tsai visited the US in September and met with senior White House officials. While the content of her conversation with administration officials remains confidential, she used her speech at the conservative American Enterprise Institute to indicate she was a partner on whom Washington could rely. Taiwan was a key US ally during the Cold War, up until the 1972 US rapprochement with China that resulted in Washington’s acknowledgement of Beijing as the government over “One China” and Beijing’s replacement of Taipei as China’s UN representative. The US continued to oppose any forcible Chinese takeover of Taiwan, and passed the Taiwan Relations Act to allow arms sales to the island. None of the three candidates could honestly explain their agenda, as all of them represent different factions of big business and their competing interests. In 2008, voters hoped that Ma would improve living standards and provide jobs, both of which had slumped under the previous DPP administration. Disenchantment has grown, however, as unemployment levels remain above 4 percent—higher than Ma’s promised 3 percent. Economic growth is expected to drop to just 4.56 percent this year and 4.38 percent in 2012. This entry was posted in News and tagged .One China Policy, Democratic Progressive Party (DPP); and People First Party, East Asian Summit in Bali, Economic Cooperation Framework Agreement (ECFA) with Beijing, James Soong, Kuomintang (KMT ), President Ma Ying-jeou, Secretary of State Hillary Clinton, Taiwan’s presidential election, Tsai Ing-wen, US-China tensions. Bookmark the permalink.